Believe it or not, a case has been filed against actress-turned Congress politician Ramya has been booked for posting a photoshopped photo of Prime Minister Narendra Modi. 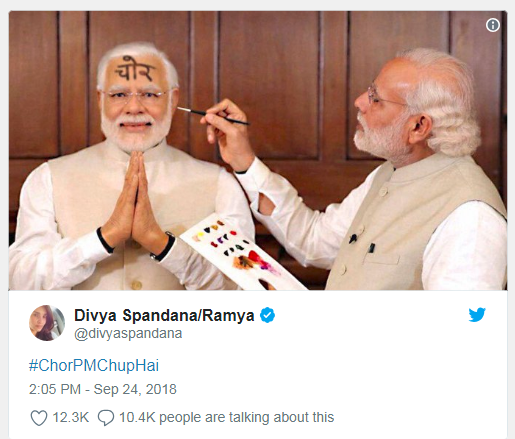 Ramya who is chief of Congress' social and digital communications had tweeted the controversial picture which shows Modi painting the text ''chor'' (thief) on his wax statue on September 24. An FIR has been lodged against the young politician from Karnakata in Uttar Pradesh under Sec 67 of the IT Act. In addition, a sedition charged was slapped against her by a Lucknow-based lawyer. Social Media Watchdog Tip: Whether this case will stand in court or not is not our concerned as a general public, but remember that what you post on social media has impact on people and their mindset. The best way to avoid unwanted case is to be careful with what you post on social media. If you can afford to fight a case like this, then maybe this tip is not for you :) After all we live in a democratic country where freedom of expression is one of the basic tenets of our constitution. This is free country. File case against the person who file against her.